Several Retro Fridays back I reviewed the first book in the Warhorse of Esdragon trilogy--The Prince of Ill Luck. I enjoyed that story immensely and was delighted to find out it was the first in a trilogy. 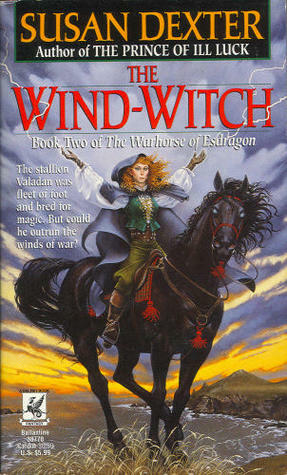 Even better, the second book--The Wind-Witch--was already out and, when I went back to purchase it, I was surprised to find that it took place several generations later in the same country and the characters from the first tale were the stuff of almost legend in their country now. Many years had passed since Leith followed his princess through hell and high water to make her honor her word to break his curse, and this second book followed a very different heroine. Though the black warhorse Valadin was there having seemingly not aged a day and that made me feel good and like everything would be all right. It's always hard to let go of those characters and friendships that first captured your attention. But, in this case, Susan Dexter's choice was a good one and The Wind-Witch is actually my favorite of the three books in the trilogy. Though they are all excellent, this one is the one I re-read regularly. First published in 1994, this series, as is so often the case with these great under-the-radar fantasy titles, this series is now out of print. But used copies are available very inexpensively. Druyan has just buried her husband. And she's not exactly the picture of a grieving widow, though she does find herself at quite a few loose ends. It was an arranged marriage and, though he was much older than she and they had little in common, she finds she misses the company and what conversation they shared. Much of this is swallowed up, though, by her realization that her farm, her land, the only place she's ever felt truly at home will assuredly be taken from her if she cannot hold the farm and keep it producing for a year and a day from the moment her husband Travic died. And so, with a stubborn sense of defiance and nothing but a couple of young girls and an elderly, arthritic cook by her side, Druyan sets out to defend her home and use the laws of the land to her advantage. Then, within the span of a few days, she becomes the unsuspecting owner of an unusually beautiful and mysterious black horse, and she discovers a prisoner named Kellis trussed up in the celler, where her husband must have stashed him without telling her when the sea-faring Errol invaders reached their land last fall. Druyan weighs his threat against her need and decides to force the obviously dazed foreigner into service to help bring in the harvest and, in the process, lets loose a force she has no inkling of. But Druyan herself is not precisely what she seems. And her own powers with the weather, combined with the marvelous horse and the mysterious Kellis, will all be necessary when invasion threatens Esdragon's coast once more. Right away I could tell this book was special. I connected with Druyan immediately and her quiet, strong personality was honestly a relief after the constant stream of vitriol and fire that was Kess in the previous book. Druyan is a weaver of some skill and, at night after working her hands to the point where they're raw, she relaxes in front of the fire and weaves cloaks and blankets and scarves of wonderful color and quality and texture. I, along with Kellis (once he's allowed in the house), watched her in wonder and appreciation at this talent I have little knowledge of or experience with. She reminds me a fair bit of Sorcha in Daughter of the Forest and Claire in Garden Spells because of the determined way she pursues her goals, the way she creates something lovely from such simple ingredients, and the way she is so hesitant--almost afraid--to grasp at the few instances of beauty in her life. I liked getting to know Kellis as well, as Druyan slowly let down her guard around him. He's a disarming beta hero and about as clumsy as a bull in a china shop. He knows nothing of farming or manual labor and Druyan has to teach him everything and bite her tongue when he displays an unusual aversion to cold iron. And it's a good thing she keeps him around despite her numerous misgivings for Kellis does have one ability she does not. And it comes in handy in a most opportune moment, when it seems everything she's worked so hard for will be lost in a moment's thoughtlessness. I love this story. I love the characters and I love the not knowing up to the last page what will happen ending. 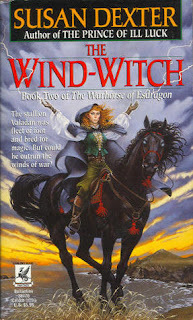 The Wind-Witch is good, solid traditional fantasy in the vein of the early Patricia McKillip books, some of Mercedes Lackey's early stuff, and Jennifer Roberson. Sorry to be running late answering this one. I'm enjoying (NOT) but first flu of the winter season and my head isn't exactly working properly. But it's such a coincidence. I was organising some folders of book cover pictures I been carying from computer to compter for ages. I set myself a mammoth task to properly name them using author, series, title. And there, showing me how pretty it was, was the art of The Wind Witch. I have no idea if I even still have the book, but I still have the cover art. I don't remember a lot about this series, except that I've got a feeling I didn't finish it, stalling on this one. I can't imagine why, given your review. I know I kept Dexter's first trilogy which I really loved, so why I dropped out on the second I can't imagine. When I'm over the flu and have to go and explore the library and see what I can find. There are just so many old book to reread and savour, How will we ever find the time. Maybe I need to do a retro Friday post as well. Is it open for other participants? Sigh, I just caved and ordered this one. I've been meaning to ever since you reviewed the first one. 10% off at Abebooks.co.uk using APRU2 until end of April, if anyone else is interested. Shipping is just as expensive as the book, though - darn the US-UK postage costs. I've never even heard of this series but I'm going to have to check out your reviews. Kerry, no way! That's so interesting. I have always loved this cover as well. Partly because they portray her accurately. She has that hair, those features. She is not beautiful, but she is strong. And I would love it if you contributed Retro Friday posts! It is most definitely open for any other participants who want to. :) I do hope you find a copy of this one. Li, lol. No shame, my friend. No shame. And thanks for the heads up on the Abebooks coupon! Sorry about the stupid shipping, though. Let me know what you think when you get to it! Morgan, yeah, it really is an under-the-radar series. But so very good. I love your Retro Fridays! It's so great to hear about a different book than whatever the current new releases are. Thanks!